A national example of this point – recent French legislation criminalizing the denial of genocides officially recognized by French law – was the subject of my post yesterday. I suggested that the French effort was an example of a legislature using the criminal law for expressive purposes – in that case, to send a message affirming France’s “humanist” values. The sponsors also defended the bill as a means of complying with the European Union’s 2008 Framework Decision on Combating Racism and Xenophobia, which harmonizes definitions of racist and xenophobic crime across the European Union. In my article entitled "The Expressive Dimension of EU Criminal Law," forthcoming in the American Journal of Comparative Law, I argue that, like the French legislature, the EU has used the criminal law as a means of affirming the Union’s core values and strengthening the Union’s political identity. The 2008 Framework Decision on combating racism and xenophobia is the clearest example of this phenomenon, but EU measures on environmental crimes and child sexual abuse also exhibit expressive elements. 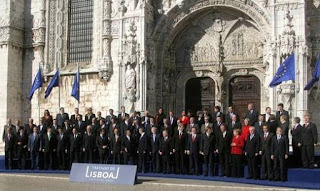 The Lisbon Treaty (prior IntLawGrrls posts) makes understanding of this essential because of its express acknowledgment that the EU has authority to pass criminal laws with respect to certain serious offenses with a cross-border dimension. (credit for photo of state officials at 2007 treaty signing) The expansion of EU powers in criminal law, a field closely associated with state sovereignty, is one element of a remarkable evolution in the Union’s identity – from an organization devoted primarily to economic integration to a political union that increasingly resembles a federal state. As the EU contemplates its expanded powers in criminal law, I argue that it ought to consider more carefully when and how it intervenes in the area of criminal justice, especially when it does so for expressive reasons. If there is no demonstrable transnational dimension and no obvious reason for supranational intervention, EU legislation on criminal matters may lack solid legal basis and may interfere with the principle of subsidiarity. Policy considerations – respect for state sovereignty, deference to democratic decision-making, and a concern for the effective implementation of EU laws – recommend a cautious approach to legislating in this field. In the end, I propose that because of these legal and policy concerns, when the EU passes criminal laws for primarily expressive reasons, it should actively engage national parliaments in the process. While this approach might reduce the frequency of EU legislation, it could strengthen the legitimacy and effectiveness of the measures that are ultimately adopted.